We hear time and again that people understand the importance of having well referenced information on Wikipedia. But most simply don’t know how to do something about it. “I did this at an edit-a-thon recently,” one conference attendee said, “and I loved it! 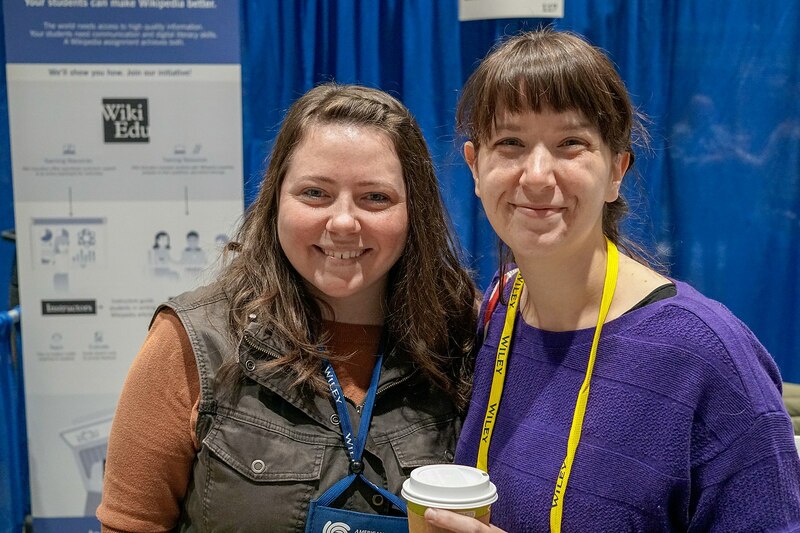 How can I do more?” In November, I traveled to three academic conferences, with the hopes of answering that question for instructors, scholars, and scientists. First, I attended the Society for Neuroscience conference in San Diego, where attendees research varied topics such as the lower urinary tract, behavioral neuroscience, and endocrinology. In my experience, many instructors in these kinds of courses crave a writing assignment where students have to practice talking about their field for an audience outside the classroom. Not unsurprisingly, blog assignments just aren’t cutting it. In a Wikipedia assignment, however, students can be asked to research biographies of people in their field or to summarize research about under-covered issues, and in the process, write about science for a worldwide audience via Wikipedia. This form of science communication can often be interdisciplinary, allowing students to bring together their course work from a variety of perspectives. Wiki Education attends the 104th annual National Communication Association annual convention. But Wiki Education is also invested in finding ways that scholars and scientists themselves can contribute. That’s why this year we developed our online professional development courses where we train subject matter experts to write articles on Wikipedia in their fields. While at the National Communication Association annual convention in Salt Lake City, I got to talk with three of our current participants. “I’ve always wanted to expand these articles on Wikipedia, but couldn’t figure out where to start. It just seemed too daunting,” Margaret D’Silva, Professor of Communication and Director at the Institute for Intercultural Communication at the University of Louisville, said to me. Luckily, that’s where our course curriculum comes in. It helps breakdown the daunting process of learning to update content on Wikipedia, all with the support of our trained Wikipedia Experts. I also had the opportunity to join a panel discussion at NCA about the use of open educational resources. 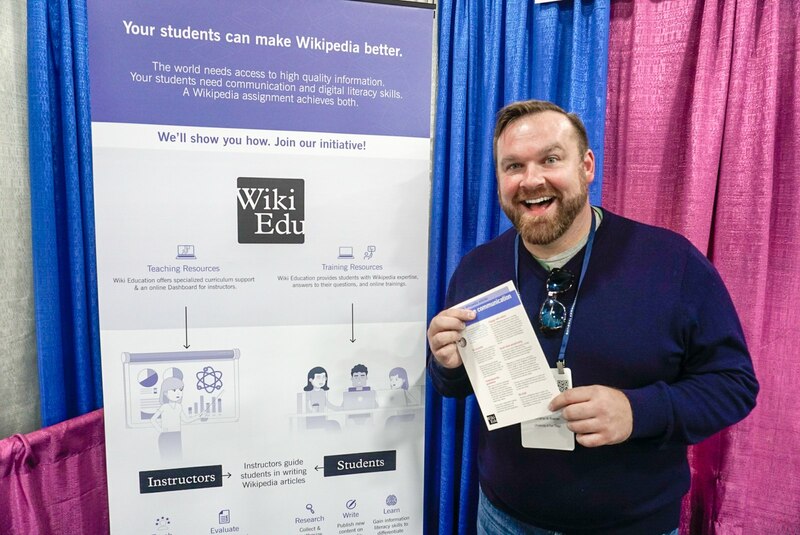 Wiki Education is no stranger to discussions of open educational practice, so we were excited to participate in that session, especially as we continue to offer free teaching tools and resources. Director of Parnerships Jami Mathewson talks with an attendee at the Wiki Education booth. My final stop in the circuit was the American Anthropological Association annual meeting. I spent most of my time talking with attendees about our upcoming professional development course in collaboration with the National Archives. The anthropologists I talked with were very excited about the opportunity to update topics about the history of women’s suffrage on Wikipedia. The course isn’t full yet though, so interested participants can apply here to join!